Note: In the past, I have expressed a certain disdain for lazy critics who rely too much on a film's press kit for their reviews. To not avail myself of the press material presented for “In the Land of the Head Hunters” (1914), however, would be irresponsible because the history of the production, release, and unlikely survival of this century-old film is so fascinatingly tortuous and the notes presented by the always fastidious Milestone Films are so extensive. Check out the info on their press page if you're interested. Photographer Edward S. Curtis is best known for his sprawling twenty-volume reference “The North American Indian” which he began work on in 1906 with funding from a humble gentleman of finance named John Pierpont Morgan. Curtis's years of extensive field research soon left him strapped for cash despite his high-level backing and he hatched a plan to pool investors' money for a feature-length film about the Kwakiutl (now known as the Kwakwaka’wakw) people of Vancouver Island in Canada. 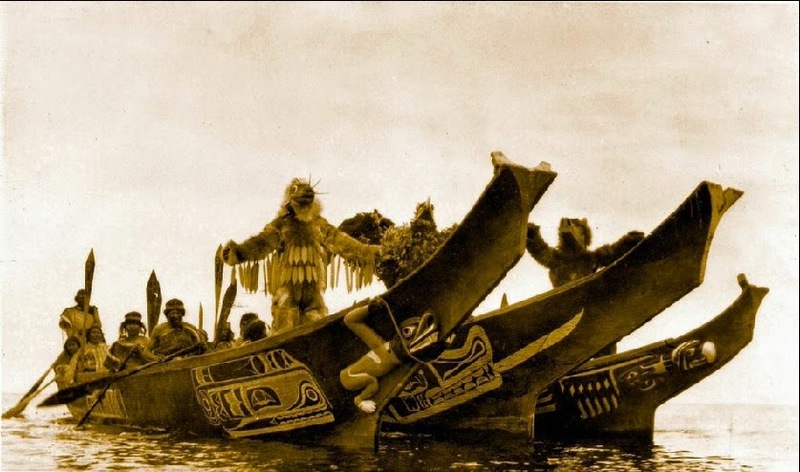 The feature-length film itself was a relatively new idea (comedy shorts being the coin of the realm at the time) let alone one starring Kwakwaka’wakw actors and shot on a remote location with limited technological infrastructure. Curtis's audacity bordered on lunacy. Curtis was already renowned for his luminous, lavishly produced portraits (today now highly sought as collectibles) and promised a similarly elegant design for his film, leading him to the heavy use of tinting and toning, a reminder that those old black-and-white pictures were not always just black-and-white. He also hired composer John J. Braham (of Gilbert and Sullivan fame) to prepare an original feature-length score, another fairly unusual idea at the time. With the crucial collaboration of George Hunt, a Kwakwaka’wakw man credited for interpretation and research but working as assistant director, Curtis launched three years of laborious pre-production culminating with a shoot on Deer Island and other nearby locations. By 1914 “In The Land Of The Head Hunters” was finished and was finally ready to take the world by storm. It certainly looked like Curtis had a hit on his hands when the film debuted in late 1914 as early audiences queued up and critics waxed rhapsodic. Poet Vachel Lindsay described it as “a supreme art achievement” at a time when this disreputable proletarian medium was seldom taken seriously as art. Alas, an ongoing dispute between Curtis and the distributor torpedoed the film's chances at a sustained theatrical release. It came nowhere close to breaking even and Curtis eventually sold off the negative and, with it, the copyright in 1922. That's only the beginning of this film's strange odyssey. Before we continue with that, however, let's talk about the movie itself. “In The Land Of The Head Hunters” tells a simple adventure tale of young Motana (Stanley Hunt), a chieftain's son, who goes on a vigil quest to gain spiritual power. Through a vision he falls in love with the maiden Naida (played by several different actresses) who is betrothed to a rival Sorcerer (Kwagwanu). The Sorcerer sends his powerful daughter (Mrs. George Walkus) to eliminate Motana but she falls in love with him instead. Eventually war breaks out between tribes over the impending wedding of Motana and Naida. Curtis's scenario occurs in a historical era before contact with European settlers and emphasizes traditional (the unfortunate adjective in the film's subtitle is “primitive”) customs and equipment, including ornate costumes and outrageously beautiful giant war canoes that were built just for the film. The cliched details of the hero's journey pale in significance compared to the film's staging of rituals such as the mesmerizing Thunderbird Dance, a sea lion hunt, and the extraordinary extended sequence of a war party on the rampage. The shots of seascapes, rocky islands, intricately carved Kwakwaka’wakw buildings and especially those amazing canoes are sometimes breathtaking and made all the more vital by knowing they are now more than a century old. Sometimes the images are still clear if a bit soft; other times they can just barely be glimpsed around the edges of a nitrate frame that is in a desperate state of deterioration (though this too has a beauty of its own); and at several points, particularly in the opening, still images have been inserted to bridge missing scenes. And this is where we pick up the story of “In The Land Of The Head Hunters” after Curtis abandoned the negative. The film was all but forgotten until 1947 when a 35mm print surfaced in Chicago in the hands of a private collector (it was allegedly found in a dumpster behind a theater). When it was screened the print caught fire but still survived and found its way to the Field Museum where a 16mm copy was created and the original (and highly flammable) 35mm print was destroyed. Little was done with the remaining copy until 1972 when the remaining material was re-edited and given a new naturalistic soundtrack: birds chirping, paddles splashing in the water, and even faux-synch dialogue when actors' faces and lips were not clearly visible. The 43-minute “sound film” was released as “In The Land of the War Canoes” and marketed as a documentary. Setting aside the dubious nature of such an indexing strategy, the new release at least preserved images of a film all but forgotten. Two more reels of the original 35mm nitrate surfaced later and found their way to the UCLA Film Archive and this would finally set the stage for the restoration of the film that Milestone Films has distributed as part of this two-disc set. A project spearheaded by academics Brad Evans and Aaron Glass sought to combine the Field Museum's 16mm copy, the two 35mm nitrate reels and an ample collection of stills in the Library of Congress's collection to bring the film as close as possible to its 1914 state. For the details on this, I refer you to Milestone's press site once again. Suffice it to say that even with multiple sources, plenty of original material was missing and will likely never be recovered. The cut presented on this disc runs 66 minutes while the original may have been about twenty minutes longer, and that 66 minutes includes the aforementioned insertion of stills to preserve the narrative structure. Milestone also secured the rights to the original score which was then performed by Vancouver's Turning Point ensemble for this release, making it one of the earliest surviving feature-length scores. 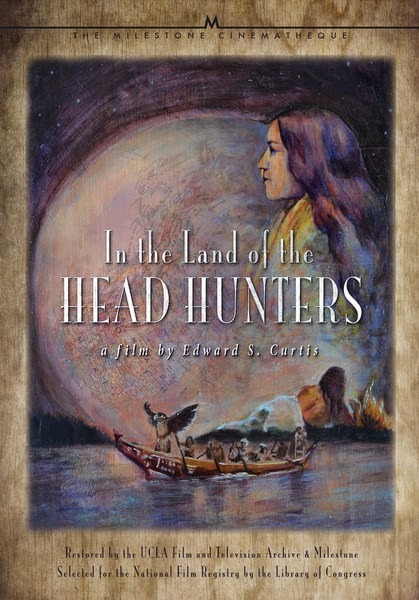 “In The Land Of The Head Hunters” is definitely not a documentary (it is set well in the past, for one thing) and some of its representations of Kwakwaka’wakw traditions are inevitably the product of Curtis's vision and cultural biases rather than fully faithful recreations. Regardless, these images are still an invaluable record of a place and a people seldom represented on film and, just as importantly, of individuals now long gone. One of the most moving aspects of the features included on this two-disc set is hearing contemporary Kwakwaka’wakw descendants of the actors in the film speak so lovingly of the personal meaning the film has for them. It's amazing that “In The Land Of The Head Hunters” was ever made in the first place, even more amazing that it has survived a full century. It didn't happen on its own. 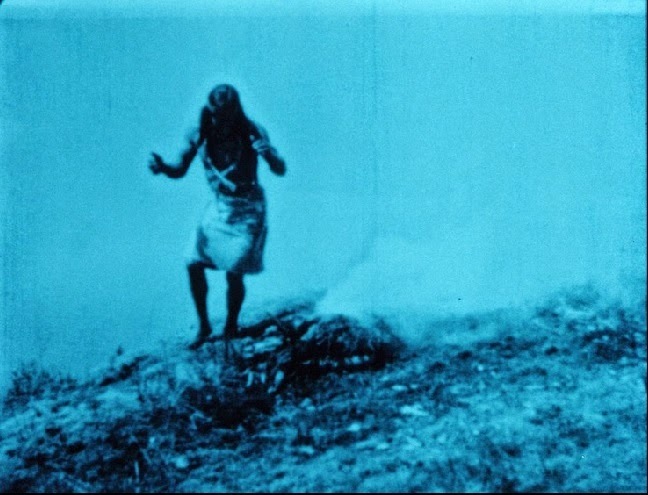 The extraordinary amount of labor required to restore the film to its current state and then to distribute it digitally is a testament to the love so many people have for this delicate medium as well as the esteem the various collaborators on this extensive project have for Edward S. Curtis's one-of-a-kind project. For reasons stated above, this transfer of “In The Land Of The Head Hunters” does not and could not possibly provide a pristine picture. The quality varies substantially from radiant to almost completely decayed; a few shots offer only a hint of image around the burned-out spots comprising most of the frame. In several cases, stills from the Library of Congress's collection have been inserted to bridge missing scenes. A variety of tints and tones is on display as well, though the B&W images tend to be the sharpest. Title cards have been recreated and these, obviously, are the sharpest-looking shots in the movie. Fortunately the better-preserved shots still showcase the beauty of the film's photography; while seldom razor-sharp they display enough detail for viewers to appreciate the artistry of many of the intricate carvings constructed for the movie. And my goodness, those canoes are works of art! Understanding the age of the material and the perilous state of its preservation over the years, this high-def image is pretty miraculous. “In The Land Of The Head Hunters” can be listened to with either a linear PCM 2.0 or a DTS-HD Master Audio 5.1 track. What you're getting with this silent film, of course, is the score - the original century-old score! - recently recorded by Vancouver's Turning Point Ensemble. The score sounds fantastic with either audio option and I don't think anyone could ask for better. “In The Land of The War Canoes” is presented with a linear PCM 2.0 track for its added naturalistic soundtrack which sounds a bit hollow and thin, but just fine. This two-disc Blu-ray set is a Milestone Films release so you know it's going to be loaded with relevant and insightful extras. For starters, Disc One includes this newly-restored cut of “In The Land Of The Head Hunters” while Disc Two is headlined by the 1973 release “In The Land Of The War Canoes” (see above for more info). Each film is accompanied by substantial additional features. The film is accompanied by a commentary track by Bill Holm, Andy Everson, and Aaron Glass. I have, unfortunately, not had a chance to do more than briefly sample this yet since I wanted to be able to sort through all these extras on this set and post a review before the end of the year! “Documents of Encounter: The Head Hunters Reconstruction Project” (2014, 37 min.) addresses the film's unusual production and release history with footage from a 2014 screening of this current cut in British Columbia. Another highlight is hearing from the son of the film's star Stanley Hunt. 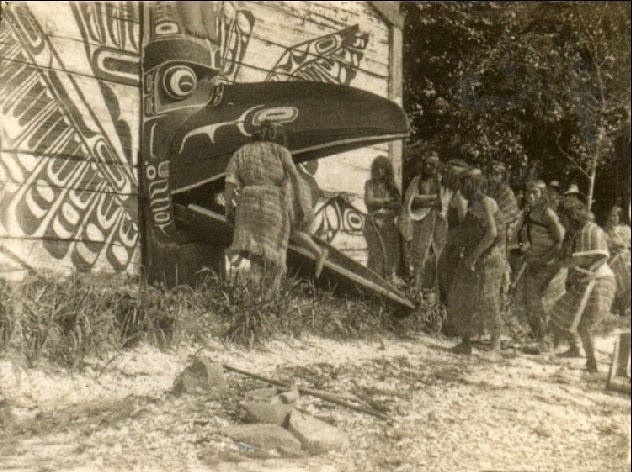 This feature suggests that the film remains very important to Kwakwaka’wakw people today. A short feature (3 min.) shows a recording session by Vancouver's Turning Point Ensemble as they play the score for the film. As mentioned above, this disc includes a high-def transfer of “In The Land Of The War Canoes” (44 min.) This is the version most people knew if they knew the film at all. It has been edited to emphasize the adventure quality even more, especially the title canoes and has an added soundtrack with effects and dialogue. “The Image Maker and The Indians” (1979, 16 min.) is an informative feature about the life of Edward S. Curtis. An eccentric host takes us through Curtis's early career including an expedition to Alaska that helped establish his reputation. It also talks about the film's release and about George Hunt, the Kwakwaka’wakw consultant and assistant director who played such an important role in the film's production. A “Cultural Presentation By The Gwa'wina Dancers” (2008, 83 min.) is a lengthy record of a performance by these dancers at a screening of “In The Land Of The Head Hunters” at the University of British Columbia on June 22, 2008. There are some amazing dances performed here and they sure went all out. The disc also includes nearly a dozen audio recordings made by Curtis. These are wax cylinder recordings of various native singers in and near Fort Rupert in 1910. Each song runs about 1 minute. How many hundred year old feature films have you seen recently? This two-disc Blu-ray set pays tribute both to a remarkable film about a remarkable people and to the extraordinary collaborative effort to preserve, restore and distribute that film. 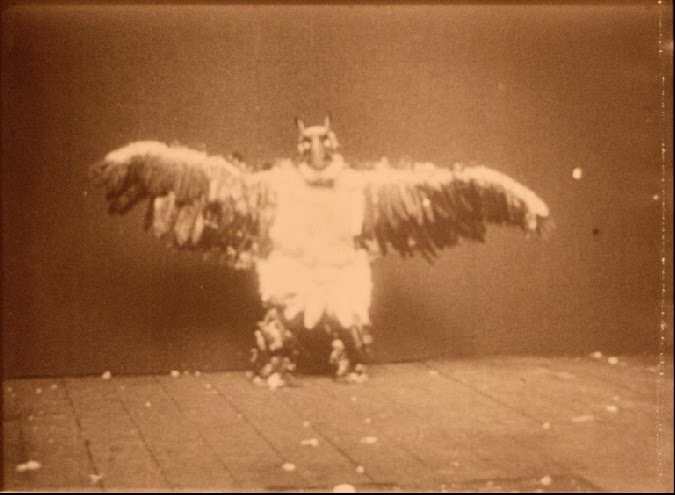 Cinema's true power is primarily that of making images seen; that these luminous images can still be seen a hundred years later is something to cherish.